The perfect cone of Mayon Volcano loomed on the horizon. It looked impossibly enormous. My co-driver revved our ATV and we zoomed towards the famous Philippine icon. This is probably the closest I’ll ever be to the deadly volcano. I don’t know how to drive, be it a motorcycle or a car; so you can tell how hesitant I was to drive my own ATV. 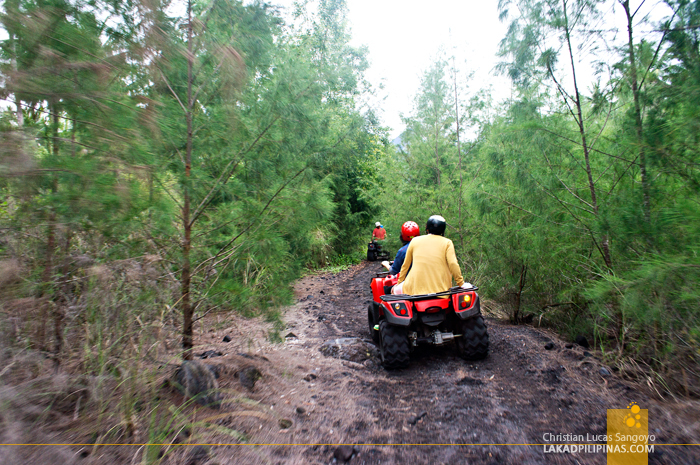 But the thrill of riding through a lava trail is simply more powerful than my hesitation. 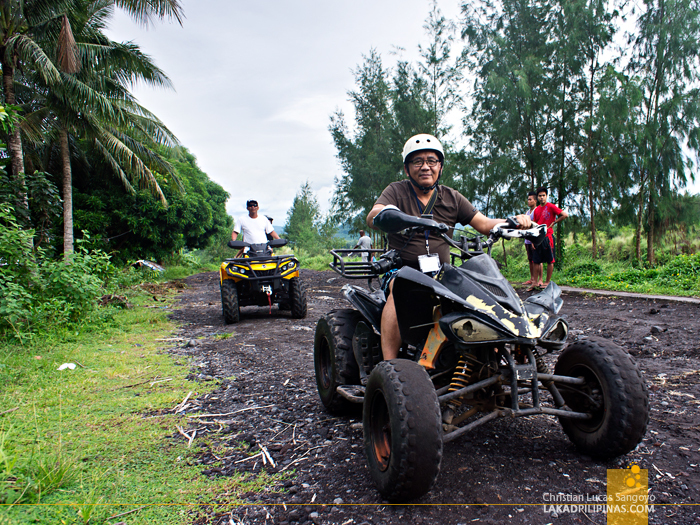 I listened carefully as the guys from Your Brother Mayon ATV Tour briefed us for the coming adventure. No racing and no overtaking; follow the marshals. Roger! 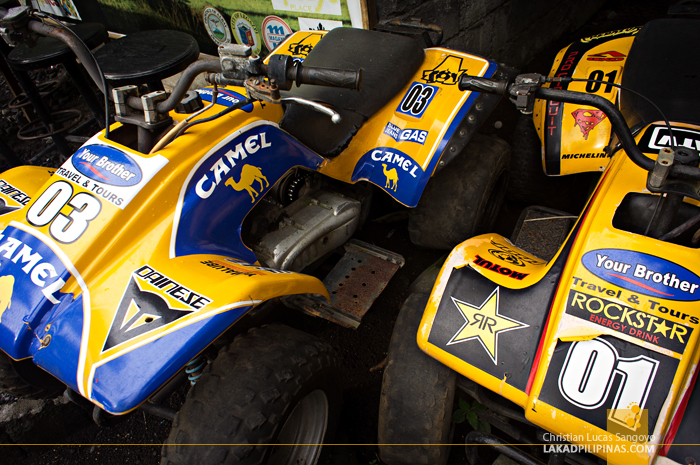 Since we were quite the big group, ATV’s were shared by two persons per vehicle. 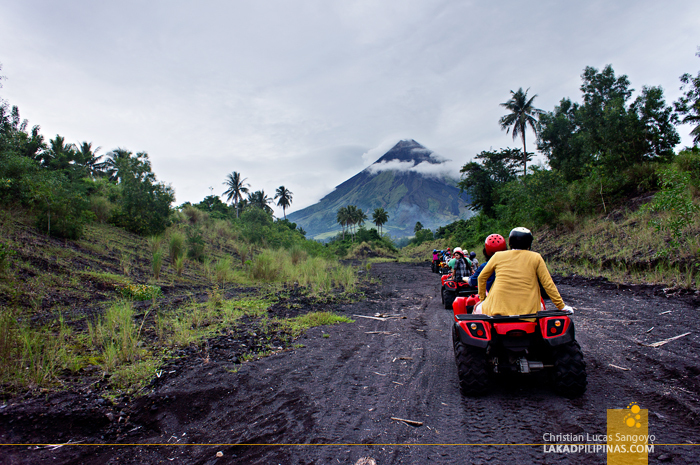 The first one drives going to Mayon’s lava wall, while the other drives back to the base camp. I decided to ride shotgun first so I can shoot while there’s still light. Not a few minutes from our starting point, our ATV conked out. 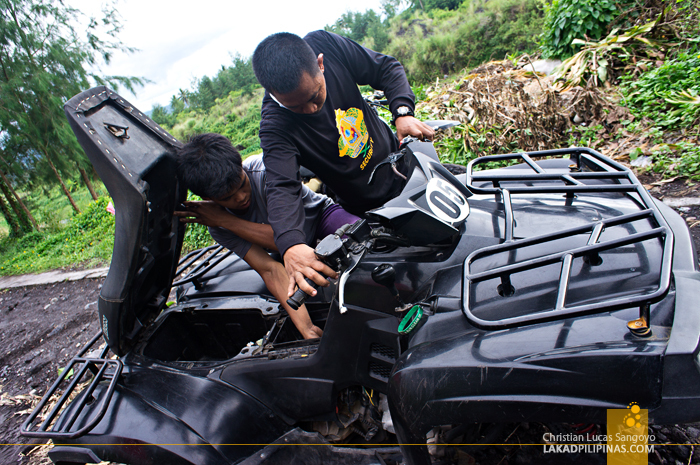 Good thing the guys from the Mayon ATV Tour are always around to fix whatever problem their guests might be having. After a quick diagnosis and some tweaking, we’re ripping dirt again. 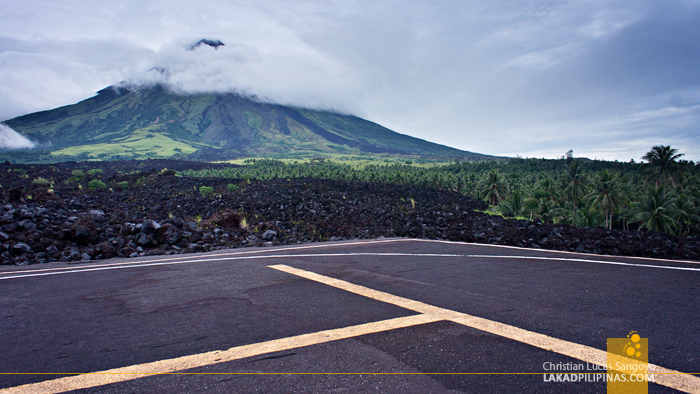 The road, which is more like a dirt path, is made up of dark rocks and rough soil that Mayon has coughed up through years of eruptions. 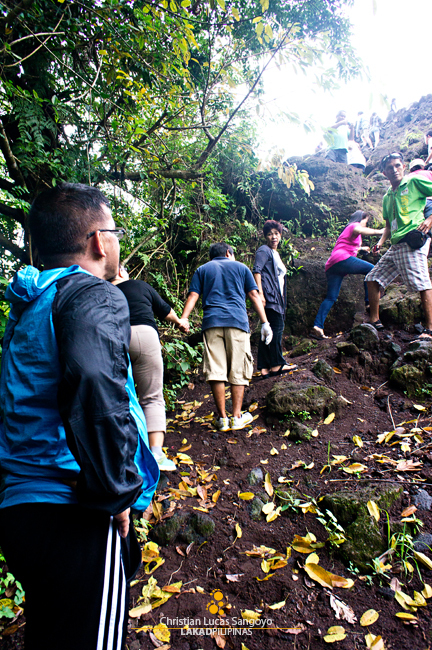 It’s unbelievable that we’re actually rolling our way through Mayon’s lava trail. The dirt road itself, even without Mayon looming beyond, is beautiful. Lush pine-laden landscapes rush through our sides and as we get closer to the volcano’s foot, the scenery changed to randomly strewn rocks and boulders. We were told we’d be going across a few rivers, but we didn’t traverse any. I can’t believe we’re still in Legazpi City! 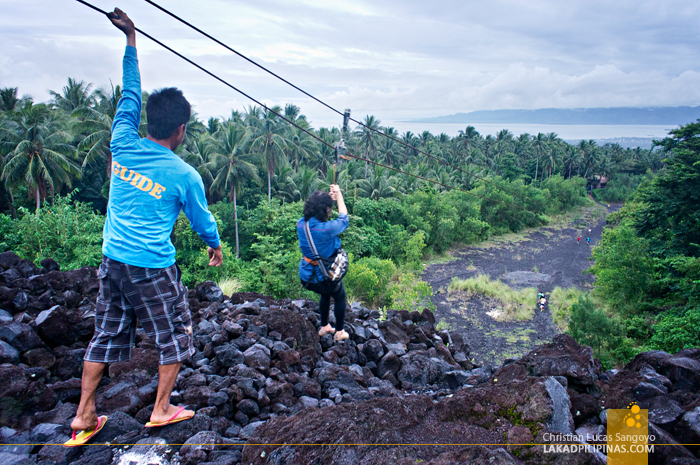 Our ride to the base of the Mayon’s lava wall clocked almost an hour long, but it seemed faster than that. Time indeed speeds up when you’re having so much fun. 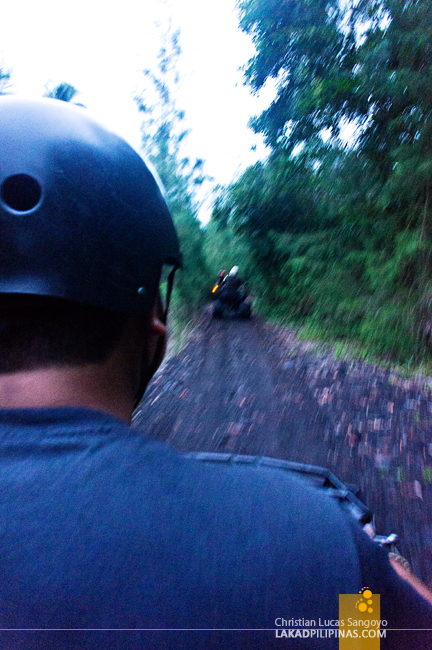 But it was time to leave our ATV for a while and walk towards the lava wall. Wait. Our guided didn’t tell us there’s climbing involved! 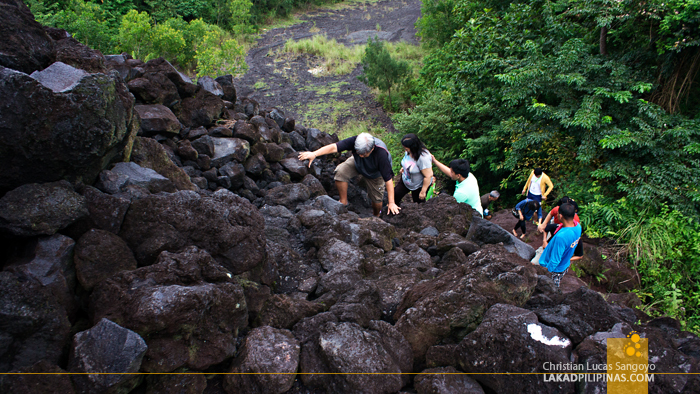 I have no idea how high the lava wall is from Mayon’s 2006 eruption, so I was astounded when I saw it face to face. Looking at it from below, I’m guessing it to be around forty to fifty feet high. I can just imagine how terrifying this hot lava wall must be as it inched forward at the time of the volcano’s eruption. And guess what we found at the top of the lava wall. A helipad! Our guide told us that this is being used as a base point for rescue missions to the volcano. Makes sense as this seemed to be the closest one can be to the volcano without being affected by its eruption (I guess?). Beyond the paved helipad, there’s nothing to see but sharp, dark lava rocks stretching as far as the eye can see. 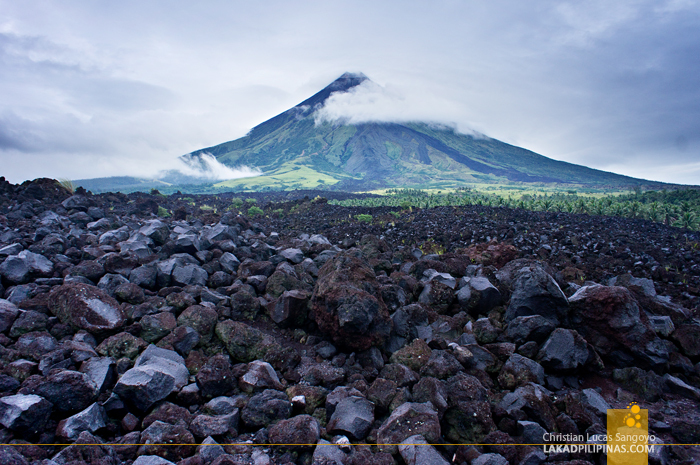 It almost reminded me of Tolkien’s Mordor, if not for the gorgeous Mayon beyond. I tried going farther but it’s extremely hard to navigate the area, the rocks and boulders are not that stable. Our guide let us pick a rock which we can bring home as souvenirs before calling it a day. Most of the guys from PHILTOA trekked back down but I was too lazy. There’s a zipline that goes down to where we left our ATV’s, so why not use that instead. It definitely beats walking! Back on our ATV, it was now my turn to drive. I’m surprised as to how easy it was to drive, its basically child’s play! I looked back one last time and bade Mayon a farewell glance. 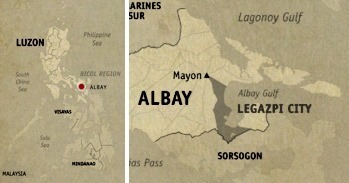 I revved our engine, released the brakes and zoomed away from Mayon’s lava trail and into the early twilight. GPS Coordinates: +13° 10' 36.72", +123° 43' 55.45"